For many decades, popcorn texture was the standard way to finish the ceiling of a room, and thousands of homes in the Reston VA area still have this outdated style. Most new homes are now finished with flat ceilings, and painted ceilings are have become popular. Fortunately, this type of popcorn texture on many ceilings can be completely removed and the ceilings can be re-finished to create a more modern appearance. There are a few Painters in Northern VA that offer popcorn ceiling removal, however, some homeowners prefer to tackle the project themselves. While the procedure is not so complex for a beginner, be aware it is messy. For those who have not tried it before, please realize that working with your arms above your head for extended periods of time can be somewhat difficult. Begin by protecting your room with plastic sheeting, which can be bought at any paint or home improvement store. First cover the floor, then tape plastic to the walls, right below the ceiling or the crown molding. If you are planning to paint the walls, the plastic process can be modified, but it is still important to contain the dust. The key to efficiently removing popcorn texture is to get it wet. Most people prefer to do this with a pump sprayer, which can be controlled more easily. If you use water, spray small areas of about 4-5 square feet at a time. Spraying the entire ceiling would not be productive because some areas would dry before you had the chance to remove the texture. Some people have tried to use paint to wet the texture but this technique isn't something that we would recommend. Nevertheless, the goal is to wet the popcorn so that it is soft enough to remove. Once the popcorn ceiling texture is wet, scrape it off using a 10 inch drywall finishing blade. The larger blade will help increase the surface area that is being scraped. Provide long scraping passes and try to avoid scraping immediately above your head. Continue to pass the sections of the drywall ceiling until all the popcorn texture is removed. Remove and discard the plastic protection. Before you paint, your ceiling will probably need some repair. Use wide putty knife to apply drywall compound to any places where the ceiling has been damaged or otherwise has nail holes or imperfections. Our Drywall Mechanics utlize an electric drywall sander that comes with a drywall dust collector. A pole sander is less expensive, however, also requires additional manual labor. In any event, it's important to sand the areas that have been re-finished. Now you are ready to paint! Begin by priming the ceiling with a drywall primer and then paint your ceiling with two coats of latex based flat paint. Davinci's Painting provides popcorn ceiling removal, and we are also experienced and trained to deal with lead paint and asbestos issues. We work in the Washington DC Area, including Reston, Fairfax, Vienna, Falls Church, Arlington, and Alexandria. 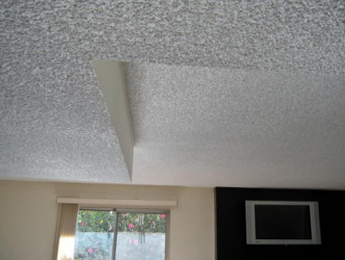 Call us for a free estimate regarding popcorn ceiling removal. I must preface this Article by stating that as a rule, you should never apply paint to stucco! What can happen is that moisture can get between the paint on the stucco and the moisture resistant backing that is attached to the structure's studs. If mold forms there, it can move through the moisture barrier and into the home. There are many contractors in the area who are not experienced with stucco and will indicate that painting the stucco is not a problem. There is a small chance that you will never experience a moisture problem if you paint stucco, but is it worth that chance? Stucco is designed to breathe. If your stucco is close to the bottom of your exterior wall, it's possible that ground moisture will come into contact with the surface. The moisture will dissipate through the stucco that is close to the foundation and become trapped between the paint and the moisture barrier. Then when that surface gets warm the moisture will expand and cause the paint to lift off of the stucco. Stucco needs to breathe! 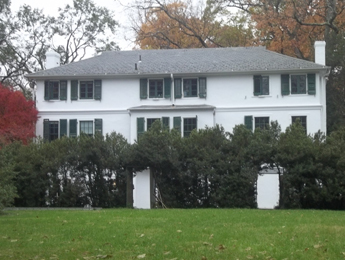 We recently completed an Exterior Project in Alexandria for a Farm House that is 100 years old. To the Home Owner's dismay, the stucco was coming off in sheets. He indicated that the stucco was re-painted about 7 years prior. Our tests indicated that the original stucco was of an oil base form. What had happened was that the previous Contractor applied latex based materials on top of the oil based stucco. For those of you who don't know, this will never work. You can never apply latex paint on top of oil based paint, without extensive surface preparation. 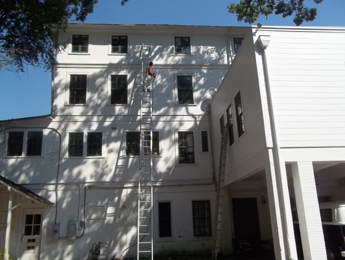 We provided a solution of a complete power-wash, oil base prime undercoat application, followed by a complete application of Sherwin Williams Marine Coatings Latex Bondplex. We are confident that that Bondplex will provide adequate adhesion for those areas of the stucco that were beginning to fail. This was project was somewhat complex due to the age of the property and the condition of the stucco. Fortunately, we had the right experience to deal with these issues. If you are considering undertaking a project and would like a second opinion, please do not hesitate to contact Davinci's your Northern VA Painting Company. It can be interesting to see Homeowners who are pressed to purchased the best quality paint yet compromise the job by trying to save a money on paint brushes. The right brush will save time and and money because it will carry more paint and enable the Painter to have better control. A better brush will also provide a smoother finish with less visible brush strokes. Not only that, you're far less likely to see those annoying brush hairs dried into the paint. One should expect to pay at least $15 for a decent 2 1/2-inch trim brush. If the brush is properly cleaned and cared for, it will last you for future projects. Another common mistake that some people make is to use the wrong type of brush. The best brush for modern latex-based paints is one made with synthetic bristles that are usually comprised of polyester or nylon. China bristle brushes, should only be used with oil based paint. If China Bristle brushes are used with latex based paints the fibers will actually absorb water and cause the bristles to loose their correct shape. Synthetic Bristle Brushes are made with nylon bristles that are soft or polyester material that is not soft. Softer bristles provide a smoother finish, while stiffer bristles can provide better control. The best trim brushes for general uses are typically made with nylon and poly blends and have good flexibility. If you're painting with a high quality product like Sherwin Williams Aura, it is best to choose a brush with an tighter flex. This will bring excellent control, even in hot or humid conditions. For thinner type of paint, such as, semi gloss or high gloss trim paints, many professionals like Davinci's Painters in Reston Virginia use ester fiber brushes that are specialized. These brushes leave an excellent finish without brush marks. That being said, there are some things to consider when choosing a paint brush. A good indicator of quality is flagging, or the split ends that you can sometimes see at the ends of the bristles. Synthetic bristles need flagging to leave behind a smooth finish. The best idea is to avoid painting brushes that are susceptible to flagging. Compare bristle density. Paint is held in place by the space between the bristles, so the more bristles a brush has, the more paint it will hold. This is often the choice for Painting Professionals because there is less loading paint on the brush. Good brushes are also tapered. The bristles of less expensive brushes are all the same length. Tapering the bristles so that the brush is thicker toward the ferrule which is the metal ring that holds the bristles against the handle. This makes the brush more rigid and provides better control over the application. Handle shape is a matter of personal preference. Many Painters in Northern VA prefer a beveled profile rather than one that is straight. The best advice for Homeowners is to find a brush that feels comfortable in your hand and that provides good control. 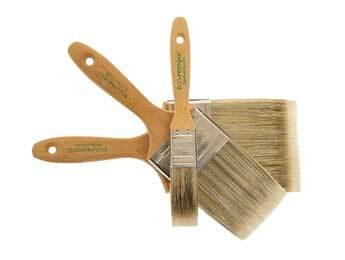 3" width brushes are good for cutting in ceilings and walls which are usually flat surfaces. However when painting trim surfaces like windows, it would be better to use a 2" angled paint brush. In fact, 2" angled sash brushes are probably the most popular brush because they're comfortable to use and can also be used for cutting. There are a few simple tests that people can perform to check the quality of a paint brush. If some brisles pull out of the handle easily, that would be a good indication that it not a quality brush. You may not select the perfect brush at the start, and you certainly won't find one in any type of bargain priced packs, but it is wise to remember, that the brush tool that you will be working with is the most important factor that provides the look of your job. Buying the right tools will always render a superior finish. I learned early on in my painting career the importance of using a drop cloths and plastic for protecting things. 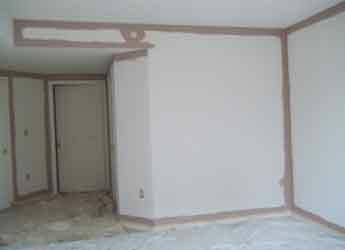 This is an important aspect for preparing a Home for interior painting. Davinci's Northern Virginia Painters also utilizes drop cloths and plastic protection for things items on the outside of a Home. These things include Porch Floors, Decks, Driveways, Concrete Stoops, and even bushes! As any well-experienced Painter will tell you, no matter how big, or how small, always use a drop cloth. It will save your self from extra work in terms of cleanup, and even possibly bigger, more serious problems. As far as what type of drop cloth to use, the type that we recommend is canvas with a rubber backing. They come in various sizes and textures, with canvas being the most common. The reasons I like using canvas drops, is because it's thick enough which prevents paint to leak through, and heavy enough so as to stay put, wherever you lay it down. Davinci's Northern Virginia Painters will first completely seal the entire perimeter of a working area with masking tape and 3 millimeter thickness of plastic sheeting. After that we then provide drop cloth protection on top of the plastic for floor areas that will be walked on. Our method of plastic and drop cloth protection provides peace of mind for our Customers, that paint, dust, and debris will not end up where it doesn’t belong. Properly covering the floors, furniture, and other valuables of the interior of your home is the first step in creating an efficient work environment, one that allows you to work without worrying about the occasional paint drop from ending up in places that it shouldn't.